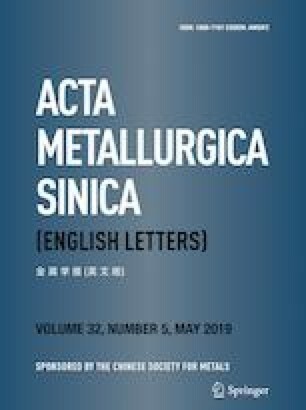 Both of the single crystal (SX) castability and undercoolability of PWA1383 superalloy were investigated during the directional solidification and isothermal cooling. In all the six SX parts of a casting cluster, no stray grains were found, revealing a defect-free SX structure. This excellent SX castability of the superalloy was attributed to its good undercoolability. The melting point (TL) and the critical nucleation temperature (TN) of the alloy were measured to be 1327 °C and 1306 °C, respectively. The statistic average of the critical nucleation undercooling ΔTN = TL − TN of the alloy was determined to be about 21 K, exhibiting a relatively great capacity to be deeply cooled to a temperature below the melting point without the onset of solidification. This work was financially supported by the Shenzhen Peacock Plan (Grant No. 20150128085205453), the Program for Guangdong Introducing Innovative and Entrepreneurial Teams (Grant No. 607264877417), the National Natural Science Foundation of China (Grant No. 51505457), the National Science and Technology Major Project (Grant No. 2017-Vll-0008), the Key Research and Development Program of Shaanxi Province (Grant No. 2018ZDXM-GY-059) and the National Science and Technology Major Project (No. 2017ZX04014001).